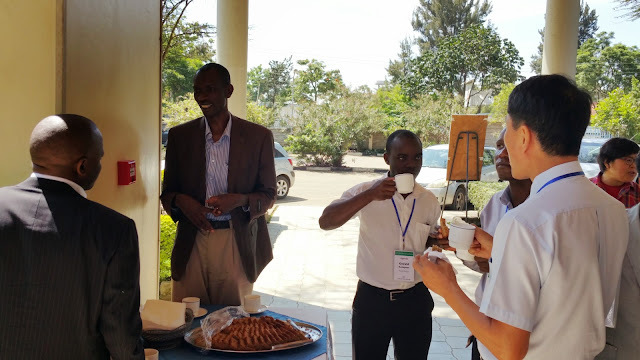 The conference took place at the Milele Nairobi PCEA Conference Site from December 26-28, 2014. 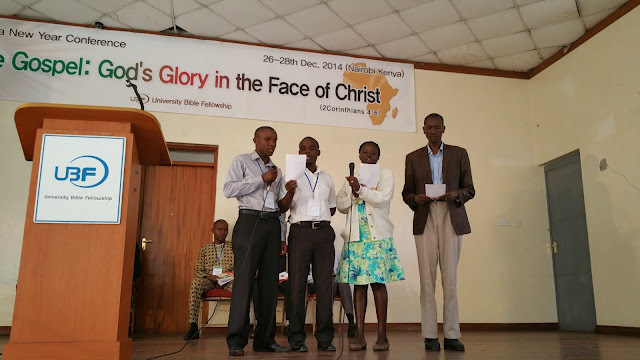 The Conference Theme is "The Gospel: God's glory in the face of Christ". For fear of contracting Ebola number of visitors to Kenya dropped to less than half, according to Msn. Jacky. But this time the record number of people attended (92 persons). Despite financial difficulty Nigeria LAGOS UBF sent James and Abraham. From Egypt Shepherd Ayman came. From S. Sudan Dr. Oyo Moses and Padiet Deng joined. 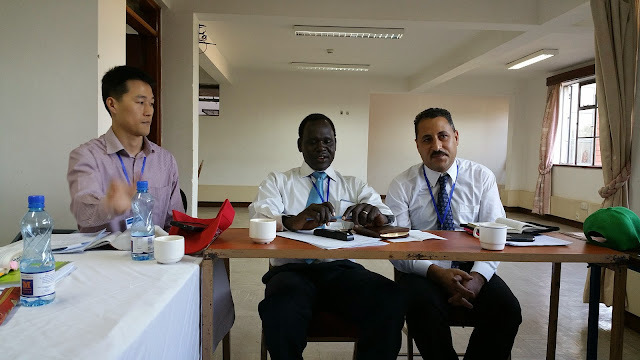 Since Ayman speaks only Arabic Dr. Oyo stayed close to him translating English into Arabic. 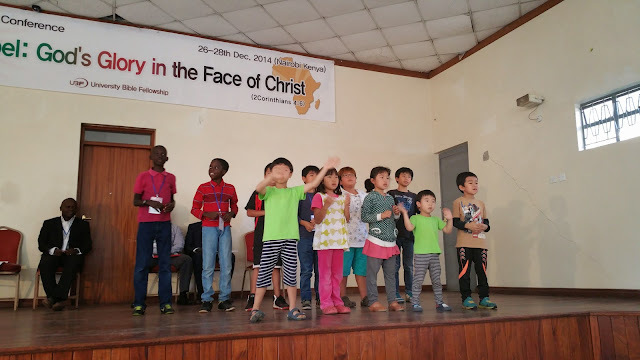 Children 12 of them were served with a special program prepared by Rosa and Anna Lee from Tongkyo UBF. Shepherd Moses Yoon brought from buckets of Korean Kimchi . In Redding Kimchi is rare, but here in Nairobi I was able to enjoy Kimchi every meal. prayer meeting, testimony sharing meeting. One Abraham and Sarah of faith in Botswana. 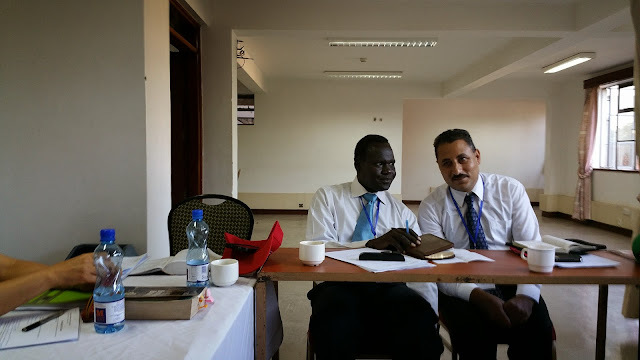 Egypt Mission Report by Shepherd Ayman speaking in Arabic with Dr. Oyo Moses translating. He believes that Egypt will be the mission center to spread the gospel through UBF mission. He rented a Bible center near the house in the name of NGO. They studied Luke gospel. 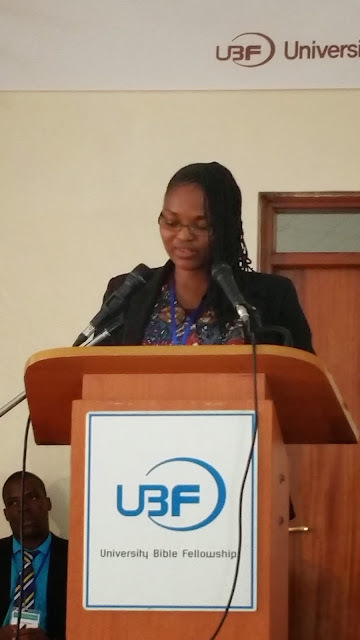 They held Esther conference with 55 students attennding. During conference some repented of their sinful lifestyle. More than 20 attended Friday worship. In September Msn. 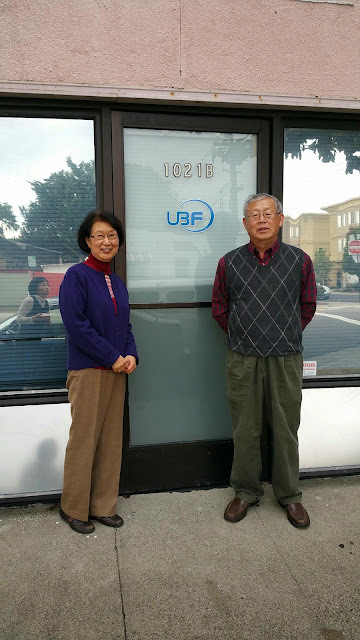 Andrew and Hope Kim family joined Egypt UBF. Prayer topics: faithful and deep Bible study every week; invitation of university students to Bible studies; moving the Bible center to a more convenient place; for Ayman to grow as an excellent Bible speaker; for Ayman's academic success as a law shool student; for peace of Egypt. Truman family moved to Ghana 2012 from Nigeria. Linda and Appian faithfully studied the Bible. Linda faithfully attends the worship. When he just obeyed God's lead, God does his own work through him. At a hostel they have sunday worship. Neighbors complained about singing. Then they found one secure place near the campus as a Bible center. Two years ago James left UBF but last year he came back Next month he is going to build a house church. This year he looks for another company, for the work is too demanding. God led his life in the best say. He has sweet wife and two lovely daughters. Linda invited her friend's sister to the Bible study. Appian invited another sister. James' coworker will join the ministry. Dr. Evan joined the ministry. He prays for weekly testimony sharing on Matthew. Pray to raise one faith of Abraham and Sarah in Ghana. Yabateck - Shepherd Duke reported. One house church was established. Weekly Bible study. Easter Bible conference. Duke served a message. Another shepherd served a message. Three shepherds led group Bible studies. 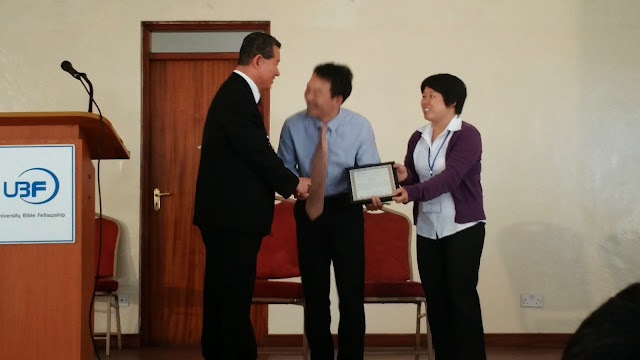 Three new students attended the conference. New disciple team was established. Bible study increased 60 weekly. Christmas Bible conference was held. Seven new sheep attended. Timothy Lee has to travel two or three times to bring sheep between center and campus every Sunday. Center relocation is needed. 15 weekly one to one, 14 sunday worship attendants, visit campus daily to invite students with 20 weekly one to one's. Pray for two house churches. 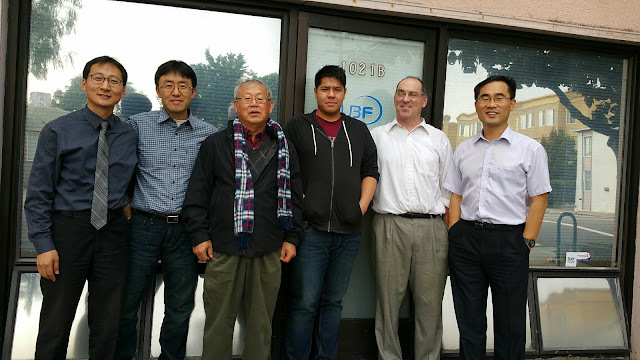 Peter Park: See vision of God; Beginning June next year he is going to begin a contract with Samsung Heavy Industry. Eighty eight students attended the Spring conference. The sign of Redemption camp is shining. God may bless Nigeria with young men and women coming to Jesus. This year they studied Luke gospel, then moved to 1 Corinthians and then nowadays Genesis. 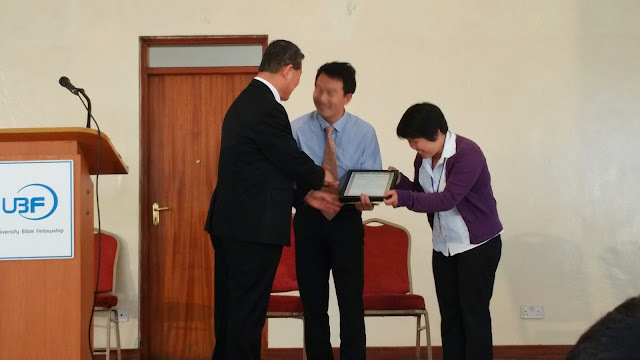 During spring conference two repented. June conference was on Genesis. Thirty five students attended Spring conference. God raised two messengers - Amele and Becky. Two sisters shared life testimony. Discipleship camp - God's personal calling. 12 brothers shared testimonies on God's calling. 7. Pretoria II, S. Africa: Joshua Surh began to serve a new ministry as of June 13, 2013. One shepherd family left. Some brothers also left. Past 17 years of work seemed to have come to nothing. In Feb conference 19 students attended. 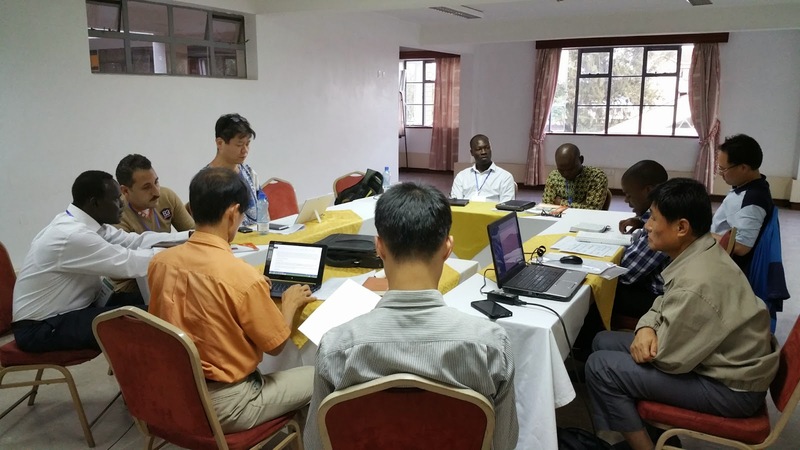 Thirty people attended the spring conference. Leaders grew up. Three sisters are growing up leading group Bible studies. Shepherd Abia, Missionary Joseph, Daniel families support the ministry. He is working as a lawyer serving more corporate clients. In 2015 they pray for Genesis Bible studies. Pray for 25 one to one, and 30 Sunday worship attendants. 8. Wits, S. Africa - Jacob Kim. Through 1 Samuel studies they overcame depression. Easter conference was attended 23 with five being new students. In Oct. they had a spring conference with 20 attending. Four brothers and two sisters attended. Every thursday missionaries and leaders share testimonies. Group Bible study was opened every Saturday at the Bible house. Namsan supported so they could open a Bible house. There they opened a common life house. Daniel and Miso Lee shepherded over the coworkers each time they were needy. Matthew, Jacob, and Desmond take turns to served the Sunday message. 9. Cape Town, S. Africa - Andrew Cortese reports. Preach the word with complete patience. Easter confeerence - 18 attended. Bible studies were given responsibilities like presiding or arranging the environment. Two sisters faithfully come to Sunday worship. Next year they pray for Romans Bible study. 10. 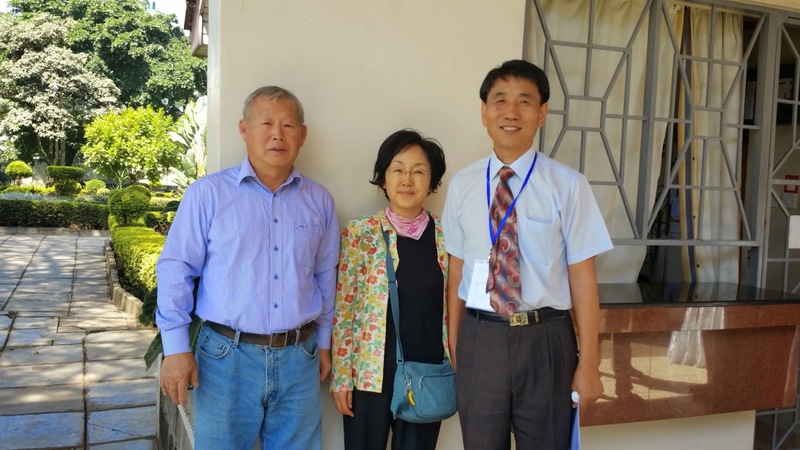 Sudan: Since Andrew Kim family left, Philiip prayed hard to keep the spirit. Faith Lee works at a Mission House Church. Two shepherds are left in Khartoum. 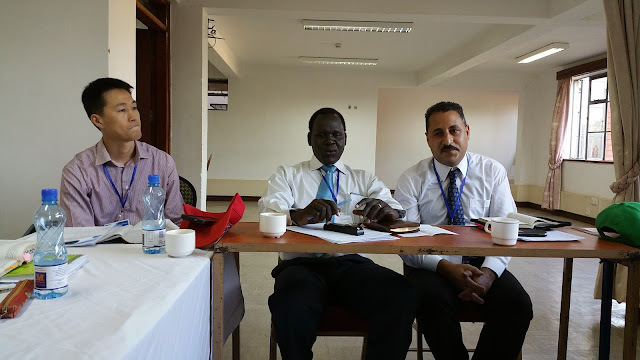 Soon they plan to move Sudann for job in S. Sudan. Becasue he works full time he was unable to visit campus. His wife is in Korea.Year 2015 they pray for 4 new sheep. 11. 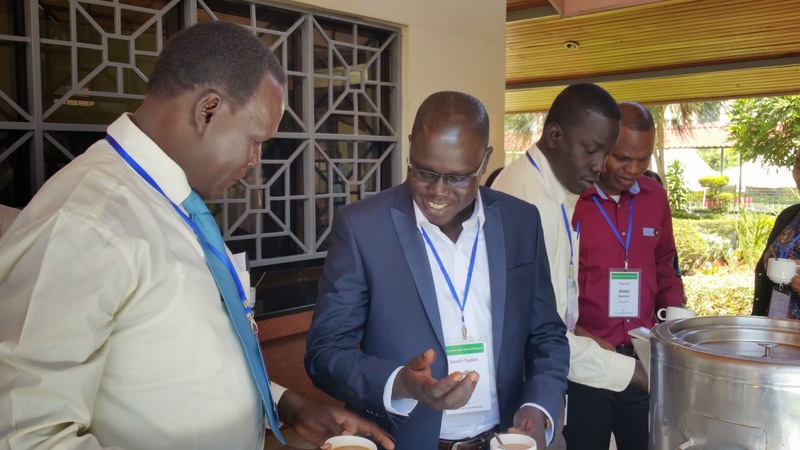 S. Sudan - Padiet Deng: Johson Deng take turns to serve the sunday messages. 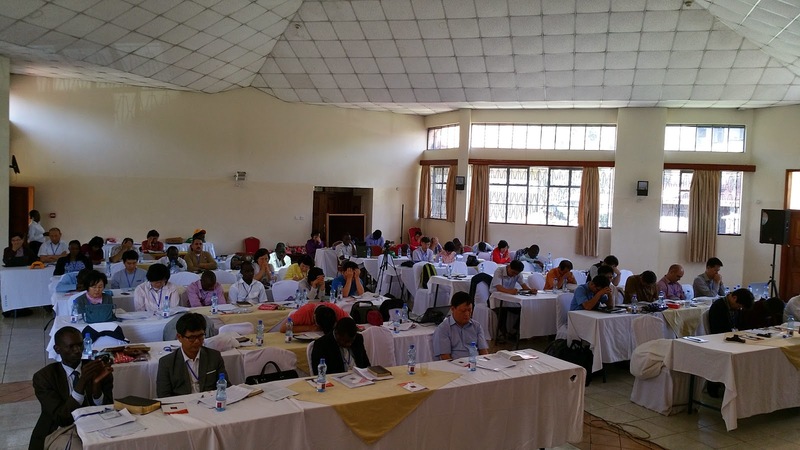 Fifty people attended the Spring conf. during the last weekend of October. The Lord raised two shepherdess candidates. Fourty six students attended Christmas worship on Dec. 21, 2014. They could buy land for Juba UBF Bible students. Pray for God to give them peace in Sudan. Pray to build a Bible center. Built 3 houses churches. Pray to move his job to a place near Juba. 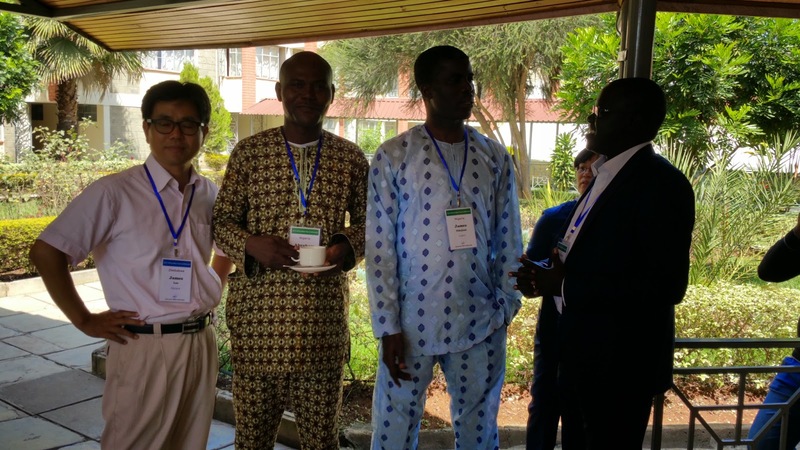 Dr. Oyo Moses and Shepherd Ayman Chaway of Egypt were in the group. Ayman does not understand English. So Dr. Oyo kept translating English into Arabic. Shepherd Julius Ecuru of Kyambogo, Uganda, came to the study holding a son Jairus (3) in his arm. The boy was quiet, calm, and meditative. He then walked away to his mom in the next room. We had two group Bible studies. Joshua Suh of S. Africa served the group. We should not lose our heart. The gospel light enables us to see God's glory. Christ's glory is manifested in our weakness and sufferings. In the procedure of electing next General Director (last Nov. Feb. 21 - nomination to be done; April 3, 2015 approval to be done at the IAM meeting in Mexico). 1. Egypt - M. Andrew and Hope Kim, M. Faith Kim, Shep. 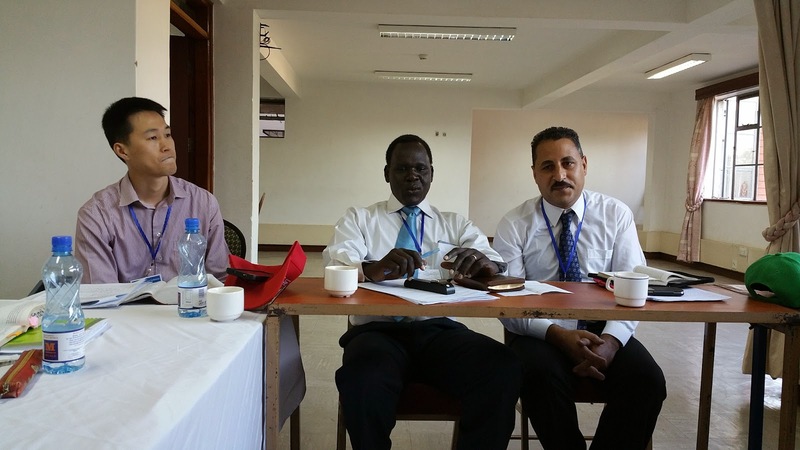 Ayman Ghana; for student ministry to build up Egypt UBF as missionary Base for the Arab countries. 5. Prayer for 2015: Glorify and Enjoy God; Christ-centered life; community and ministry; keep following the way of suffering and glory; keep the vision of reaching out all of the major cities and campuses of Africa beginning in the country we serve in our generation. 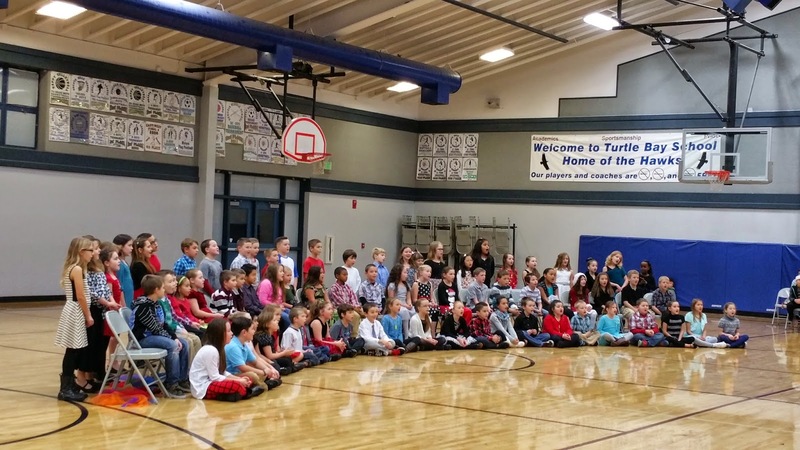 During the evening hours of December 17, 2014, the Third-graders at the Turtle Bay Elementary School, Redding, California presented a Christmas music program at the gym of the school. The program included Carols in different languages like Hebrews, English, and Latin. Marie Kim (8), my grand-daughter, was chosen to present the choir to the audience singing the carol entitled "Silent Night". Before the Choir singing she walked out of the seat, took the microphone, and introduced to the audience the origin of Silent Night saying, "Silent Night was written when an organ broke on Christmas Eve in 1818 in a small Austrian church. The song was finished just in time for midnight mass. The words were sung in German and accompanied by a guitar. It is one of the best loved carols." 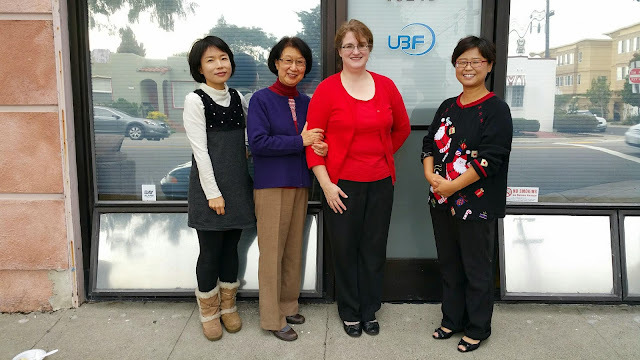 December 14, 2014 West LA UBF shared the good news of the great joy, and celebrated the birth of our Lord Jesus. Thank you for your prayer and love for West LA and my family. Today we studied Phi 2:5-11, "True meaning of Christmas" with 124 people. Please pray for our 13 intern cadidates of 2015 to receive training well this winter vacation. May the Lord bless the blessed decision of the 13 to follow Jesus as Harvest Workers. Return to Me and I Will Return to You Zechariah 1:1-14:21 Key Verse 1:3 “Therefore tell the people: This is what the LORD Almighty says: 'Return to me,' declares the LORD Almighty, 'and I will return to you,' says the LORD Almighty.” Welcome to the Monday night Bible study. Tonight we will cover Zechariah. At the outset the Prophet Zechariah lays down the purpose of the book, that is, to exhort his audience to return to the Lord. Let us read 1:1-3. Thankfully for us Zechariah conveniently set forth the contents of his prophecy, that is, what the audience ought to do in view of what the Lord promises to do. I. Return to me. "Return to me and I will return to you." In the book of Haggai, the Prophet Haggai, who was one of Zechariah's contemporaries, encouraged the returnees returning back to the homeland from the Babylonian captivity to return to the Lord by working hard on building the house of the Lord. What additional message did the Lord have for the returnees then? There are two clues to consider: the first clue is found in the call itself, that is, "return to me, and I will return to you." Here "me" or "I" indicates that the real point of the return for the Israelites to return to is the Lord God himself. We find another clue to finding the real message the Lord chose Zechariah to convey in the last part of the prophecy, that is, in Zechariah 14:20-21. Let us open the Bible and read this blessed passage: "On that day HOLY TO THE LORD will be inscribed on the bells of the horses, and the cooking pots in the LORD'S house will be like the sacred bowls in front of the altar. Every pot in Jerusalem and Judah will be holy to the LORD Almighty, and all who come to sacrifice will take some of the pots and cook in them. And on that day there will no longer be a Canaanite in the house of the LORD Almighty." Here the expression "holy to the Lord" is repeated twice. This repetition indicates that the real point of message is the Lord’s call for "everyone" to become "holy to the Lord." Further, there is a surprising prophecy that says, "And on that day there will no longer be a Canaanite in the house of the Lord." Here the "house of the Lord” refers to the family of God. It does not refer to just a physical structure, such as a temple made of timber and stones. A “Canaanite” denotes those who remain disobedient to the Lord. This observation helps us better understand the true desire the Lord God wants to fulfill, that is, bringing his children to the intimate fellowship with him, so that his children would be as "holy" as the Lord himself. "Return to me and I will return to you." Again the [ultimate ending] point of returning is to attain to the holiness of God. Zechariah's conclusion is nothing new though, for in Exodus 19:5-6 the Lord God revealed this purpose of calling the slave nation Israel, saying, "Now if you obey me fully and keep my covenant, then out of all nations you will be my treasured possession. Although the whole earth is mine, you will be for me a kingdom of priests and a holy nation. These are the words you are to speak to the Israelites." The Lord's purpose in calling Israel as a "holy" nation goes to the original purpose for which God created man, because in Genesis 1 and 2 we see that God created man to be "like him" (Genesis 1:26-28). In leading the Israelites out of Egypt, Moses said to Pharaoh (who is symbolic of Satan), "There is no one like the Lord our God" (Exodus 8:10). In what respect then is God different from all others? It is only in one respect, that is, his holiness. (Isaiah 2:2) The amazing truth though is that God wants his children to be "like" him. Why should a [dusty] man be as holy as God is holy? The only reason given is "because God is holy” (Lev 11:44,45; 19:2; 20:7,26; 1Pe 1:16). Why then does he want his children to be holy "because God is holy"? Genesis 1:26-28 indicate that God's holiness serves a practical purpose, that is, to enable his children to become dominant rather than dominated by God's creation. In fact this dominance is the key attribute of God's holiness, for unlike all that have been created by God, God remains dominant. One of the meanings of dominance is independence in the sense of self-sufficiency. God alone is self-sufficient. He alone is not dependent on other sources than himself. The Bible explains this concept in different ways, such as: "His reward is with him, and his recompense accompanies him" (Isaiah 62:11), and, "Behold! I am coming soon! My reward is with me" (Revelation 22:12). In short, God wants his children to be as holy as God is so that by becoming like God, his children would fulfill the purpose of God's creation, that is, to rule the universe and everything in it as seamlessly as God himself. "Return to me and I will return to you." The main duty the returnees (and certainly all who are created in God's image) should fulfill is to remember the purpose of God's calling. [Remember that in Hebrew “Zechariah” means “(the one whom the Lord) remembers.”] We can easily understand the importance of this requirement (the call to remember the purpose of calling) when we think about what we do in making a journey, because a man who does not know this purpose is like a man who wants to go somewhere, but does not know where he wants to go. How can one go anywhere when he does not know where he is going? A greater tragedy is that not knowing the real purpose of life (attainment of God's holiness) people keep going somewhere. Since they do not know where to go (or what to do with their lives), in an attempt to find the meaning and direction of life, they look around themselves and see how others are doing. Then, a majority of them go the way the world does. The Israelites made the same mistake. While they were in Egypt, they did not know God’s purpose for them. In his mercy the Lord gave them the real purpose of life. Then the Lord sent them into the Promised Land. But after entering the Promised Land they conveniently forgot God's purpose of calling. They looked around themselves and saw how the Canaanites were doing and they followed their evil ways and wicked practices. What then happened to them? The Lord kicked them out of the land. They went into exile in Babylon. How did they do in Babyon? Again most of them forgot God's purpose of calling. As they were coming back to the Promised Land they again forgot God's calling. The returnees were about to waste their lives all over again. What then did God do for them? He established a prophet named Zechariah whose name means "remember." Remember what? God sent him to help them "remember" the original purpose of calling, that is, to be a "holy" nation. And for this purpose the Lord invited them to return to him. II. I will return to you Each time we hear the Lord's call to be holy, the charge is so overwhelming that we say, "We are born in sin. How can we be made as holy as God is?" Most likely the returnees must have felt the same way. Yet, God never compromises on the ideals to which he calls his children. Then what is the answer to the question we have? Again the second half of Zechariah 1:3 answers the question, "[Return to me] and I will return to you." The first half (return to me) is what we are called to do, whereas the second half promises what the Lord will do for us. Since God gave each person the decision to either return or not to return, it behooves us to choose to return. When we make a decision and indeed turn to the Lord, the Lord himself does the rest, that is, he meets us at a meeting point. There he takes our hands, and leads us to the place we are called to go. Indeed in the book of Zechariah we see the Lord coming up with all the provisions necessary to help his children fulfill the Lord's command. Our God is different from worldly dictators. Pharaoh in Egypt asked the Israelites to make bricks without providing them with materials. But God always is the God of grace. God never asks anyone to do anything without first providing that person with the means by which to do what is being asked. The same is true with the call to return to the Lord. Zechariah consists of 14 chapters which are loaded up with the provisions for his children. Chapters 1-6 record the visions the Prophet Zechariah saw one night. The vision of riders under myrtle trees shows God's intention to return to Jerusalem to make the city 'holy' again (1:7-17). The four horns and four craftsmen represent God's plan to set aside the enemy nations, so that the Israelites would come back to the holy land again (1:18-21). The man with a tape measure shows the Lord sending an angel and a heavenly "carpenter" (or "engineer" if you will) to the Jerusalem temple to get the temple rebuilt for God's holy name (2:1-13). Joshua receiving a new garment as a high priest points to the mediator by which sinful men can have their sins atoned for and thereby come to the fellowship with the Lord and so robbing Satan of any basis to accuse God's children of any defects (3:1-7). The vision of the Branch and the promise to remove the sin of the land in a single day looks forward to the day of the Savior to come as an atoning sacrifice for the sins of the world (3:8-10). The lamp-stand and two olive trees speak of the way in which the Lord God administers his graceful work of salvation that is through the work of the Holy Spirit as administrated by the laity (Zerubbabel - governor) and clergyman (Joshua - the high priest) (4:1-14). The flying scroll refers to the message of judgment on all who reject God's truth (5:1-4). [The curse of the flying scroll is necessary because in order for the life of obedience to become blessed, the Lord must come up with the means to enforce that those who go against God's truth must suffer from the ill consequences, i.e., God's curse. After all who will keep the law when no one enforces it?] The movement of the basket (containing a woman) from the land of Israel to Babylon points to the Lord preparing the environment in which the holiness can be incorporated in the lives of true worshipers (5:5-11). And the vision of the four chariots, especially the spirit resting in the north, shows the Lord sending his Spirit to rest on the remnants who stay in the northern part of the land but are called to return to the Lord (6:1-15). In chapters 7 and 8 we find a question about fasting and the Lord's answer to the question. But the fasting is (or should be) for the Lord (so that people would learn of the Lord's holiness, so the Lord would be pleased with them) (cf. 7:4-5). Chapters 9-14 contain the visions (or oracles) on the Messianic ministries, both at the time of the Lord's first coming as well as the Lord’s second coming. In the book of Zechariah Jesus Christ is depicted in different names, symbols, and types. The “Branch” is one (3:8; 6:12), Joshua is another (3:8), and Zion’s king coming into the city of Zion riding on a donkey is still another (9:9). All the visions, the people’s question and the Lord’s answer to their question on fasting, the work the Messiah is to fulfill during his first and second coming, all lead to one point: the Lord’s provisions for the people returning to the Lord. And these provisions are custom-tailored to facilitate the call for all fallen men to overcome themselves and participate in God's holiness. The call to attain to God's holiness echoes through the Bible from generation to generation. From day one of Adam's fall, the Lord expressed his desire to redeem and restore people back to him. The same call was on the returnees of the day of the Prophet Zechariah. And the same call is on all who live in this post-modern era. This call is going to be on the generations to come as well In conclusion, through the Prophet Zechariah the Lord says to the returnees, "Return to me and I will return to you." The promise for the Lord's return is not empty; the Lord's promise to return culminated in the coming of our Lord Jesus Christ who offered himself on a tree as a ransom sacrifice. When Jesus comes again the Lord will bring to completion God’s vision to restore all the saints back to his holiness. When this vision becomes a reality there will be no longer a Canaanite in the house of the Lord. One word: Return to me and I will return to you ________________________________________________ Class Exercise: 1, Fill the blanks: Did not my words and my decrees, which I commanded my servants, the prophets, __________ your _____________? 2. True or false. 1) Angels can pray to the Lord, and the Lord responds. T( ); F( ) 2) Each angel is mindful of his own business and does not concern himself with other angels' business. T ( ); F ( ) 3. The Lord was "a little angry" with _________. But the Lord is now (as of the time when Zechariah saw the visions) "very angry" with the nations that feel secure. Why? ___________________________________________________________ 4. If Joshua (a high priest) does the job right he will be given a _________ among the __________. 5. Two _____ trees _____ golden oil into a ____ bowl through the two pipes to supply oil for the ____ lights on top of the gold lampstand. 6. The Lord's temple is to be built not by _______ or by ______ but by my _________. 7. Jeremiah saw a king (of Jerusalem) coming to _______ riding on a ______, on a _____, the ______ of a donkey. 8. Who took the thirty pieces of silver and threw them into the house of the Lord to the potter? __________ 9. On that day HOLY TO THE LORD will be inscribed on the _____ of the ________. Why on the "horses"? (cf. Isaiah 35:8; Eph 2:19-22) The end. 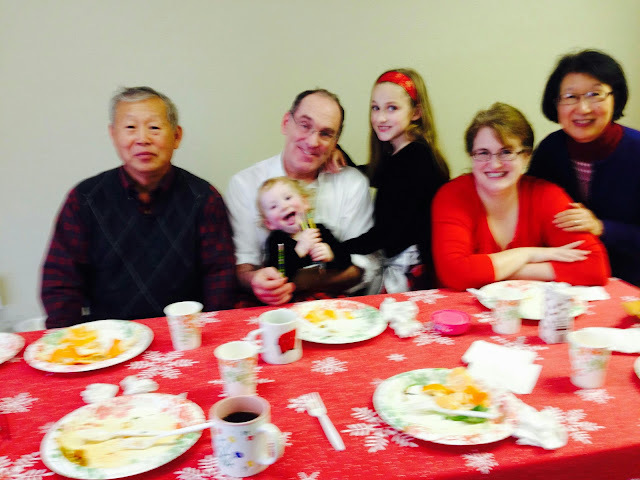 At 10:30 am on December 7, 2014 we had a Christmas worship service. 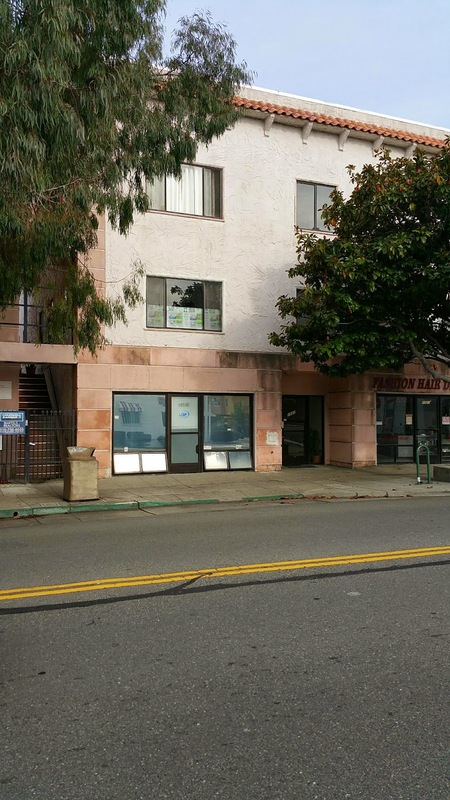 The worship took place at the bible center located at 1021 Solano Ave, Suite B Albany, San Francisco. Kara his second daughter supplemented the message by coming out of the children's compound and jumping up on the daddy. Lovingly he held her up in his arm just like Joseph holding the baby Jesus, and he continued on speaking on the baby Jesus. himself by becoming obedient to death. even death on a cross! States. So, why do we like Christmas so much? There are two great Christian holidays. behalf. In the greater American society, however, Christmas is much more popular. our deep, personal love relationship with our Savior. to the greater sacrifice of his incarnation. The Son of God put aside his divinity. his equality with God. and became flesh making his dwelling among us. come in his heavenly glory to receive the honor, praise and tribute that he deserves. our Lord and our King put aside his superior nature and took on the nature of a servant. about what he sacrificed for us! Why? So that he could be with us. decided to stop eating lunch with him, because I wanted to eat at the “Popular Table”. himself, gave up his honor, glory, prestige and power and made himself nothing. that he endured in our places. we love them. What is the purpose of Jesus’ sacrifice for us? and to give us the gift of eternal life. What is it so great about eternal life? be to be with Jesus in his kingdom! lonely anymore because Jesus was with me! and helpless for them? Humanly, it’s impossible! But in Christ all things are possible! In Galatians 2:20, Paul expressed how it is possible for him. and for any believer. himself to us so that we may love others with his love. his love, with his thoughts, with his grace. Let’s read our passage one more time together. “In your relationships with one another, have the same mindset as Christ Jesus. "...become mature, attaining to the whole measure of the fullness of Christ." It is already December, and it rains today. In my backyard there is a gum tree. 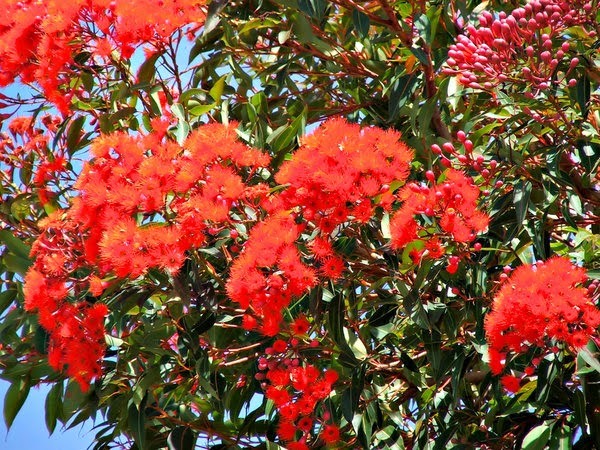 It blooms a few times a year, bearing red flowers. Its leaves are all green. 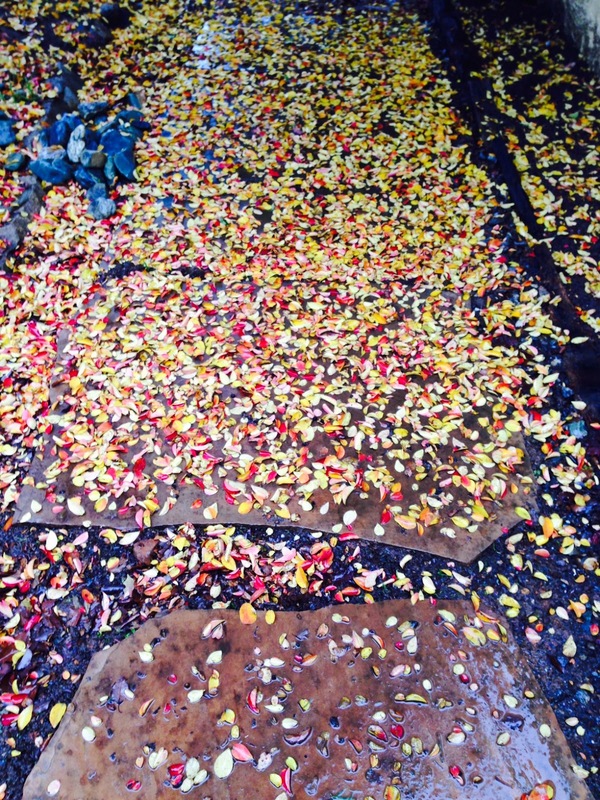 Yet, in the fall the leaves turned colorful. 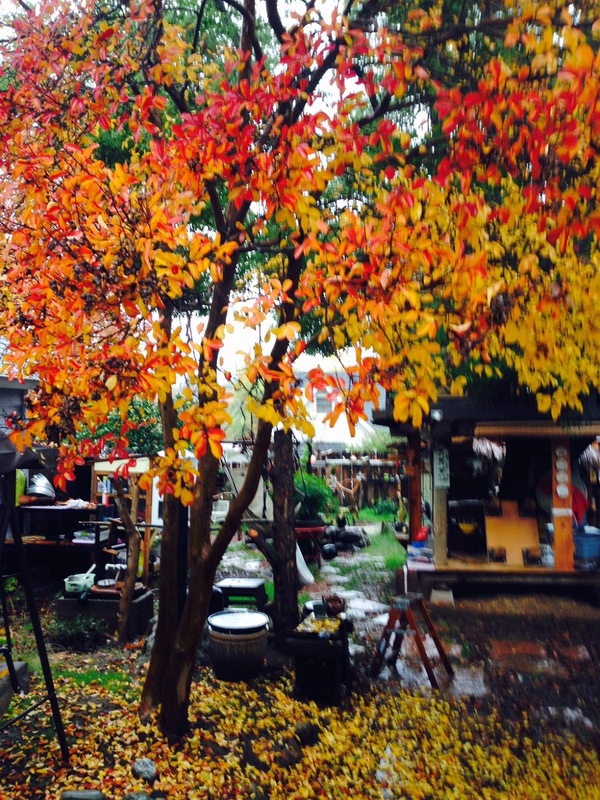 And Fall makes me think the meaning of life. Now that the winter is getting deeper, as it rains leaves drop to the ground, and each leaf finishes a life's journey in its perfect beauty, which reminds me of the scripture first above written. I did not open the facebook a long time but this morning, as I opened it up my eyes landed on this message which I thought worth spreading. In early August my wife and I, along with seven of our nine children, left for a month-long ministry tour in Africa (Kenya, Zambia, and South Africa). It was a couple of days before we got settled and had any access to media. As such, I was taken aback when I began to receive Google alerts, emails, and Facebook and Twitter messages either demanding that I comment on “Ferguson,” or condemning me for failing to do so. The only problem was, I had absolutely no idea what they were talking about. Who, what, or where was Ferguson? Why was it such a big deal? Why was I being condemned (along with other “high-profile” evangelicals) for “failing to speak out on such an important issue”? I eventually got up to speed. Or at least I found out what all the fuss was about. Over the next several weeks I viewed this issue from a unique perspective. I was an American in Africa watching an issue ignite ethnic tensions in my homeland. It was almost surreal. My first response to Ferguson was to say nothing. I was on the outside looking in. I didn’t know what happened. I didn’t know the communities or the issues surrounding the tensions. Second, I chose to remain silent because people were demanding that I speak—even condemning me for my silence. In this age of “I sure would love to hear your thoughts on” I get tired of the sense of entitlement with which people approach those whom they deem to be popular or high-profile Christians. No one is “entitled” to my opinion. Nor is my faithfulness to God determined by how quickly I respond to “relevant” issues. As a pastor, I have a responsibility to my flock. If those for whose souls I care (Heb. 13:17) want help thinking through these issues, I am obligated to them. I have a duty to walk them through issues like these to the best of my ability, and with sensitivity to their particular needs. What worries me is that Christians in the age of social media care more what “popular” preachers have to say on issues like this (and whether or not they agree with other “popular” preachers) than they are about taking advantage of an opportunity to work through challenges in the context of Christian community. More importantly, it worries me that so many Christians view themselves primarily as members of this or that ethnic community more than they see themselves as members of the body of Christ. Rest assured, I do believe there are systemic issues plaguing black men. These issues are violence, criminality, and immorality, to name a few. And all of these issues are rooted in and connected to the epidemic of fatherlessness. Any truly gospel-centered response to the plight of black men must address these issues first and foremost. It does no good to change the way white police officers respond to black men if we don’t first address the fact that these men’s fathers have not responded to them appropriately. There is indeed an epidemic of violence against black men. However, that violence, more often than not, occurs at the hands of other black men. In fact, black men are several times more likely to be murdered at the hands of another black man than they are to be killed by the police. For instance, in the FBI homicide stats from 2012, there were 2,648 blacks murdered. Of those, 2,412 were murdered by members of their own ethnic group. Thus, if I am going to speak out about anything, it will be black-on-black crime; not blue-on-black. I want to apply the gospel and its implications in a way that addresses the real issue. If a few black men being killed by cops requires a national “dialogue,” what in the world does the overwhelming number of black-on-black murders require? If the police do not see black men through the proper gospel-centered, image-of-God lens, what does the black-on-black murder rate say about the way we see ourselves? In addition to violence, black men are plagued with criminality. Low-income black communities like Ferguson know all too well that black criminals preying on their neighbors makes life almost unlivable. Growing up in South Central Los Angeles, I know all too well what it’s like to have bars on the windows and doors for fear that thugs will break in to steal or kill. I remember being robbed at gunpoint on my way home from the store one day. It was one of the most frightening and disheartening events of my life. The fear, helplessness, and anger I felt stayed with me for years. And it taught me an unfortunate lesson: the greatest threat to me was other black men. The underlying malady that gives rise to all the rest of these epidemics is immorality and fatherlessness. We know that fatherlessness is the number one indicator of future violence, dropout rates, out-of-wedlock births, and future incarceration. And in the black community, more than 70 percent of all children are born out of wedlock! Fatherlessness is the bane of the black community. Nor is this plague forced on us. It is as common as morning dew, and as overlooked as dust under a refrigerator. Where are the marches against this travesty? Where are the protestors who demand better? Where are the black “leaders” who . . . oh, that’s right, they have just as many illegitimate children as anyone else. Again, it is common knowledge that this is the most immediate root cause of the ills plaguing black Americans. Again, this experience stayed with me for years. And for many of those years, I blamed “the system” or “the man.” However, I have come to realize that it was no more “the system” when white cops pulled me over than it was “the system” when a black thug robbed me at gunpoint. It was sin! The men who robbed me were sinners. The cops who stopped me were sinners. They were not taking their cues from some script designed to “keep me down.” They were simply men who didn’t understand what it meant to treat others with the dignity and respect they deserve as image bearers of God. It does me absolutely no good to assume that my mistreatment was systemic in nature. No more than it is good for me to assume that what happened in Ferguson was systemic. I have a life to live, and I refuse to live it fighting ghosts. I will not waste my energy trying to prove the Gramscian, neo-Marxist concept of “white privilege” or prejudice in policing practices. I don’t care what advantages my white neighbor may or may not have. If he does have advantages, God bless him! I no more fault him than I fault my own children who have tremendous advantages due to the fact that they were raised by two educated, Christian parents who loved, disciplined, and taught them. Ironically, when I think about THAT advantage, I am filled with joy and gratitude to God for his faithfulness. People are supposed to bequeath an advantage to their children and grandchildren (Prov. 13:22). Why, then, would I be angry with my white neighbor for any advantage he is purported to have? And what good would it do? How does that advance the gospel? Especially in light of the fact that growing up with the gospel is the ultimate privilege/advantage! It is the advantage that has granted us all “American privilege”! Are we guilty for being citizens of the wealthiest republic in the history of the world? I think not! In the end, the best lesson my children can learn from Ferguson is not that they need to be on the lookout for white cops. It is far more important that I use this teachable moment to remind them that “God is not mocked, for whatever one sows, that will he also reap” (Gal. 6:7). Moments before his death, Michael Brown had violently robbed a man in a store. A man doing the best he could to make a living. Minutes later, Brown reaped what he sowed, and was gunned down in the street. That is the sad truth. My sons have far more to fear from making bad choices than they have to fear from the police. The overwhelming majority of police officers are decent people just trying to make a living. They are much more likely to help you than to harm you. A life of thuggery, however, is NEVER your friend. In the end, it will cost you . . . sometimes, it costs you everything. Voddie Baucham is the pastor of preaching at Grace Family Baptist Church in Spring, Texas. In studying the so-called 12 minor prophets, one question that comes to mind is, "Why did the Lord find it necessary to establish the prophet who is responsible for the book of the prophecy in addition to the prophet’s contemporaries?" [His contemporaries include Isaiah, Amos, and Hosea.] In other words, "What is the message which the Lord God intends to convey through that particular prophet?" These questions are in order for we know that as God is the God of economy he does not do anything that is not needed. One of the ways to find the answer to these questions is to consider the prophet himself. If a prophet is a “true” prophet, he not only declares the words of the Lord but also "lives" the message he is called to convey, for a true prophet serves the Lord’s message not just with his lips but with his life. A prophet’s whole life itself testifies to the words of the Lord. So you read the messenger and you understand his message. The book of Micah shows us that Micah adopted a lifestyle that was different than the lifestyles of the majority of the people of his day. With his unique lifestyle, the Prophet Micah conveyed to the people of his generation the Lord's message loud and clear. The question then becomes, "What (or who) enabled him to live the way he did?” We can find the answer to this question in the meaning of the name “Micah,” for in Hebrew the word “Micah” means, "Who is like Yahweh?" Reflecting on the meaning of his name, towards the end of the prophecy Micah asks, "Who is a God like you?" This observation gives out a strong indication that it was his fellowship with Yahweh who empowered him to live the way he lived. Practically then how did Micah live? What are the marks of distinction? The first mark of distinction has to do with the perception of the future. The way in which the general public perceived their future was very different from that of Micah, for Micah saw the future of the Israelites in a way that others did not about their own future. Micah served three kings of Judah (Jotham, Ahaz, and Hezekiah). A study of the history on Judah during the reign of these kings indicates that in the days of these three kings, especially King Hezekiah, people in Judah entertained an optimistic view of life. For one thing, Judah as a nation amassed lots of military arsenal (2 Chronicles 32:1-8; Isaiah 36:1-37:8), for another the national economy seemed booming, so people were busy to secure opportunities to get rich and then super-rich. In the year of 2006 and 2007 the U.S. economy seemed booming. The real estate market in Downey, California remained robust so that a three bedroom, one and a half bath house with a small backyard would sell for over $700,000. Homeowners saw their home values going up two or three times more than the amount of their mortgage, so they cashed out of their home several hundreds of thousands of dollars. Using this money they acquired titles to other assets, such as a second home, brand new cars or a small business like a liquor store. The national economy of Judah in the day of Micah was more or less the same. This trend is reflected in Micah 2:2, which reads, "They covet fields and seize them, and houses, and take them. They defraud a man of his home, a fellow man of his inheritance." Operating with the widespread optimism on the future of the nation a lot of people in Samaria and Jerusalem indulged themselves in pleasure seeking lifestyles. In the royal palace, Ahaz and Jezebel lived as party animals using people's tax money. People on the streets were more or less the same. Micah 1:7 reads, "All her idols will be broken to pieces; all her temple gifts will be burned with fire; I will destroy all her images. Since she gathered her gifts from the wages of prostitutes, as the wages of prostitutes they will again be used." Here the words, "idol," "images," and "prostitution" point to various forms of pleasure-seeking lifestyles. In Micah's day people abandoned the worship of the God of Abraham and instead worshiped idols (1:7). Idol worship caused their minds to be filled up with adulterous images, which in turn prompted them to adopt promiscuous lifestyles, so that the spirit of prostitution took over the society. The life that is mixed with spices, such as idols, images, or prostitution, tends to make man "feel" good. So they say, "Money is good. Life is good. So what is the problem?" But Micah had a different view. While people in general went about gaily, Micah said, “I will weep and wail.” Look at v. 8. "Because of this I will weep and wail; I will go about barefoot and naked. I will howl like a jackal and moan like an owl." Why is he going to weep and wail? Why does he say, “I will go about ‘barefoot and naked’”? Why does he say, "I will howl like a jackal and moan like an owl?" Have you heard a howling jackal? Have you encountered an owl moaning at night? When all others were going “hunky dory,” why did Micah choose to weep and wail? Why did he choose such a somber lifestyle? Is it because he became insane? Who went crazy, Micah or the "hunky-dorians"? More fundamentally than these questions is this: "What made the difference?” The answer is this: Micah saw that the people of his day had absolute reasons to weep and wail rather than to laugh and dance. But in their blindness the people did not see the disasters that were going to hit them down the road. Unlike the general public, Micah walked closely with the Lord. As he walked humbly with the Lord, he came to realize what the Lord thought of the people of his day and what he would do to them. In a number of places the Lord God introduces himself as a holy God. God is a holy God. As the holy God he cannot compromise with any hint of sin. Being the holy God he has to punish every hint of sin. The only reason why it does not seem that God's judgment is not immediate is because God patiently waits for his people to repent (Romans 2:4). But when people persist in their rebellious ways of life despite the Lord’s continued warnings, the Lord comes up with a whip. The second point of distinction is found in Micah 3:8, "But as for me, I am filled with power, with the Spirit of the LORD, and with justice and might, to declare to Jacob his transgression, to Israel his sin." It is interesting to note that Micah refers to both "power" and "might". Why did he need to be filled with both "power" and "might"? We can understand the necessity of the power and might when we think about the meaning of power (or might). According to Merriam Webster’s Dictionary, “power” means (among other meanings): the ability to act or to produce an effect; legal or official authority or capacity; physical, mental or moral efficacy. This definition indicates that in order for one to fight against the power of sin, one needs the ability to act against the power of sin, and thereby produce a result, that is, defeating the power of sin working in men. In order to fight against the power of sin he needs spiritual authority to work with. He also needs physical, mental, moral and spiritual power to fight against the power of sin and win victories. To be aware of man's sin problems is one thing, to be able to stand up against it another. Not all who desire to live righteously can do the latter; only those who garner enough strength can rise to fight the battle against the power of sin. It has been said that God’s children are faced with three enemies: Satan, self, and the world. According to 1 John 3:8, it is the devil who promotes sin. (1 John 3:8) And no human being is a match for the devil. In order to help people not to fall victim to the devil’s ability to tempt man to sin, one needs God's help. Another formidable enemy of God’s children is entrenched in each person, and that enemy within is his or her own “self”! So in order for one to fight against the power of sin working inside, one must gain the power and strength to stand up against the power of sin working inside. The battle that goes on inside is more dreadful and harder to fight and win than on the outside. Speaking of the same truth, Martin Luther said, "I am more afraid of my own heart than of the pope and all his cardinals. I have within me the great pope, Self." Similarly, he said, "I more fear what is within me than what comes without." Further, he said, "I feel much freer now that I am certain the pope [inside and outside of me] is the Antichrist." For this reason Jesus said that we need to deny ourselves. But we cannot deny on our own. It comes only through God's might. And the world has always been evil. The Bible says that the devil is the ruler of this dark world. So in order to stand up against the sinful world, one needs God's power. Obviously, Micah understood these truths. So he chose not to rely on his own might. Rather he relied on God's power, that is, the power that comes from the Spirit of God, so that he says, "But as for me I am filled with power, with the Spirit of God..." Then he bravely stood up against the power of evil. He boldly declared the transgressions of proud people (2:1-5); he spoke against the leaders of Jacob, the rulers of the house of Israel (both political and religious leaders such as false prophets or the corrupt priesthood; 2:6-12). In so doing he declared God's judgment (exile to Babylon) coming down on the wicked. The Lord fulfilled his prophecy by destroying the Jerusalem temple in 586 B.C. and exporting his people to Babylon. Thirdly, Micah stood out from others because he had the hope of the Lord coming. In Micah 7:7 the Prophet confesses: "But as for me, I watch in hope for the LORD, I wait for God my Savior; my God will hear me." What are the contents of the hope he had? For what or whom did he wait? Let us open the Bible and read three passages: Micah 4:1-8; 5:1-7; and 7:18-20. These passages describe the visions of the Lord’s redemption. The Lord will turn the vision into reality by personally coming to his people in Bethlehem (5:2), shepherding over his flock (5:4), forgiving his people of their sins (7:18-20), and establishing his kingdom from among all peoples on earth in and through the remnants of Jacob (4:1-8; 5:7-8). Through the Spirit of prophecy the Lord revealed these visions to Micah. In the meantime the Lord planned to discipline the Israelites by exporting them into a foreign land. Indeed, about one century after the Micah’s prophecy the Lord sent the Israelites to Babylon. After seventy years of captivity in Babylon the Lord brought the remnants back to the Promised Land. Then, as Micah prophesied, the Savior was born in Bethlehem. The Savior shepherded over his flock in the strength of the Lord. As the good shepherd, the Savior named Jesus gave his life on a tree as a ransom for many and thereby fulfilled the prophecy to "tread our sins underfoot and hurl all our iniquities into the depths of the sea" (Micah 7:18-20). The people of Micah's day lived with one hope or another. But their hopes were not based on the Lord’s promise to send the Savior. Rather their hopes were based on what is of temporary endurance (such as buying a retirement home or saving more money into retirement accounts at one financial institution or another.) Some however despaired, so they resigned themselves to a hedonistic lifestyle saying, "Let us eat and drink for tomorrow we die." But Micah lived in the hope of the Savior coming. This hope empowered him to go against the stream of the wicked generation. In conclusion, let us read Micah 7:18, "Who is a God like you, who pardons sin and forgives the transgression of the remnant of his inheritance? You do not stay angry forever but delight to show mercy." The question, "Who is a God like you," stimulates us to wholesome thinking. His question prompts us to examine and revise the ways of our life in view of the kind of God we have. Martin Luther once said, “The God of this world is riches, pleasure, and pride.” But Micah introduces to us a different God. While others devoted themselves to the God of riches, pleasure, and pride, Micah devoted himself to the God whose name is Yahweh. Then the Lord revealed himself to Micah. This revelation in turn helped Micah to act justly, love mercy, and walk humbly with the Lord (6:8). When he walked with the Lord, the Lord empowered him to overcome this sinful world and live as the lamp light shining God's light of salvation on this dying world. One word: Who is a God like you? 1. In Hebrew Micah means, "Who is like Yahweh?" In view of the book of Micah, "Who is like Yahweh?" 2. Micah 6:5b reads, "Remember your journey from Shittim to Gilgal, that you may know the righteous acts of the Lord." What "righteous acts" did the Lord do for his people during their "journey from Shittim to Gilgal"? 3. According to Micah, which mountain is "chief" among [all] the mountains? 4. Again according to Micah, what is "good" for man? 6. Which of the following is (or are) not the words of Micah? 5) What misery is mine? 6) Because I have sinned against him, I will bear the Lord's wrath. 7) I watch in hope for the Lord.